March | 2012 | Life in a fast, furious, fugacious lane! One of the biggest challenges facing the world today is climate change. If experts are to be believed, the world has five years to initiate another industrial revolution, one that is low on carbon emission, before runaway climate change becomes inevitable. On Earth Hour 2012, 8:30 pm on March 31, millions of people around the world will come together to call for action on climate change by doing something simple: turning off their lights for one hour. 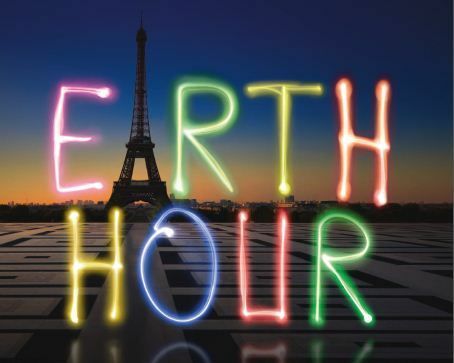 Earth Hour started in 2007 in Sydney, Australia when around 2.2 million homes and offices turned their lights off for one hour to assert their stand against climate change. One year later, Earth Hour has become a global sustainability movement with more than 50 million people across 35 countries participating. India joined the movement in 2009. Over 5 million across 56 Indian cities showed their support by switching off for one hour, saving approximately 1,000 MW of power. As climate experts would like us to believe, it is a small gesture with grand rewards. 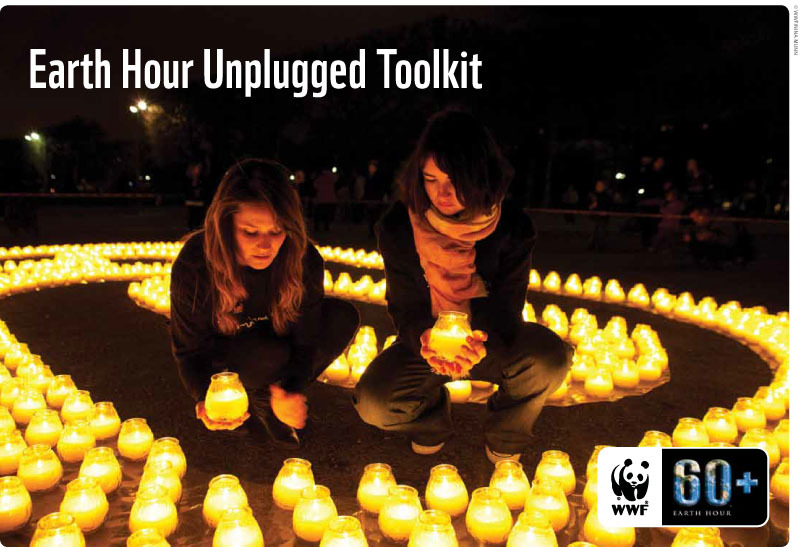 In what is expected to be the world’s largest mass event, Earth Hour 2012 will witness the assemblage of over one billion people in more than 6,000 cities, turning off lights for one hour on one night. Iconic buildings and landmarks across the globe like Acropolis in Greece, Eiffel Tower in Paris, Hiroshima Peace Gardens in Japan, and Pyramids in Egypt will go dark for an hour. 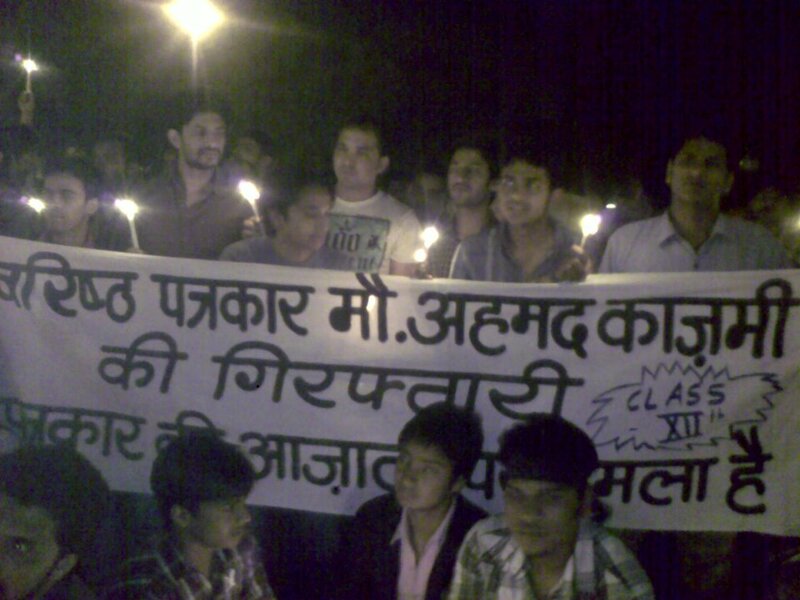 In sub-continent, this year, Earth Hour is expected to be bigger than previous year. People will be encouraged to switch off lights in their homes and offices between 8:30pm-9:30pm on March 31 2011. Our participation will show the world that we are united in our fight against global warming. We must demand commitments to reduce greenhouse emissions to save the planet. The clamour for the release of journalist Mohammad Ahmad Kazmi, detained in connection with the recent attack on an Israeli diplomat’s car in New Delhi, is gaining momentum with each passing day. 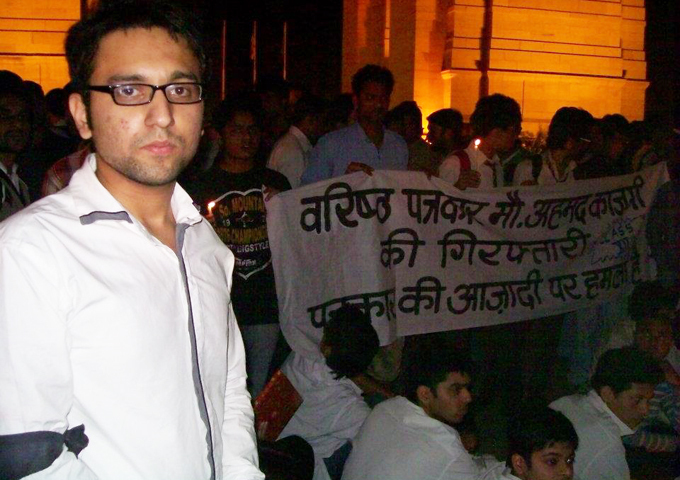 The relentless protests against his “unlawful” arrest by Delhi Police’s Special Cell have spread across the country. There have also been allegations of custodial torture and third-degree harassment levelled against police by the scribe’s family. On Saturday March 17, hearing a petition filed by Kazmi’s family, Chief Metropolitan Magistrate Vinod Yadavslammed police officials and instructed them to wear their proper uniforms, with name tags, during interrogations – and asked them to maintain a register of those officers who questioned the journalist. Kazmi’s counsel asked the court to be allowed to be present during interrogations, so that he could ascertain who was questioning the suspect, and whether or not he was being subjected to harassment. His family has alleged that Israeli intelligence agencyMossad has questioned him, attempting to force him into a confession. The 50-year-old writer and broadcaster was picked up by police on March 7, while he was returning to his home in Jor Bagh from the India Islamic Cultural Centre on Lodhi Road. He has been accused of providing the “logistical support” to the main bombing suspects. The accused bombers, apparently Iranians, have already fled the country, police claim. Kazmi’s family, friends and colleagues have trashed the charges against him as baseless and manufactured. They say he has been framed, primarily because he is an outspoken critic of US and Israeli policy – and the government needs a scapegoat. He is being held under the stringent provisions of the Unlawful Activities Prevention Act, which allows him to be held for 20 days in police custody, which, according to legal experts, is grossly disproportionate in such a case – where police have yet to produce evidence against the accused. “The DUJ cautions that Mr Kazmi must not be victimised, merely because he has worked for Iranian broadcasting and written for Persian newspapers,” said the uinion’s statement. On March 11, the Coordination Committee of Indian Muslims criticised police, saying the journalist had been arrested without evidence against him. “It is a matter of alarm that now a senior member of the Urdu journalist community has been arrested without any apparent evidence or proof,” said the committee. The Safdar Hashmi Memorial Trust (Sahmat) also expressed its outrage at Kazmi’s arrest, and the harassment of another senior journalist, John Cherian. “Following the blatantly high-handed arrest of Kazmi, there was an attempt to enter the house of Cherian [on] Sunday on the specious plea of a hoax call. These independent journalists whose professional integrity is above reproach are being targeted to create a fear psychosis,” said a statement. Kazmi’s son Shauzab Kazmi, SQR Illyasi of Jamaat e Islami and I addressed a public meeting organised by the Democratic Students Union in Jawaharlal Nehru University on March 16. “Kazmi’s arrest does not come as a surprise, as it follows the well-known pattern of a minority witch-hunt by the Indian state,” said the DSU. Condemnations of Kazmi’s arrest have also come from the Communist Party of India and the Lok Janshati Party. There have been many solidarity marches, peaceful protests, sit-in demonstrations and press conferences held by Kazmi’s supporters across the country – including in Mumbai, Pune, Hyderabad, Aligarh, Meerut, Lucknow, and even as far afield as the UK and Muscat. “It is good to see people standing up and speaking out for my father, who has been framed on totally bogus charges,” said Kazmi’s 23-year-old son, Shauzab. He has been busy attending protests, giving press conferences, meeting lawyers, and looking after the family ever since his father’s arrest. “We will spare no effort to prove his innocence, and I am pretty confident that the truth will prevail in the end,” his son Shauzab said. Shauzab’s brother, Turab, has decided to skip his Class 12 board examinations this week to fight for his father’s freedom. The brothers are not alone in this fight for justice. Today, everyone here is Kazmi. Exactly 25 years back, a tiny, sleepy, forlorn village surrounded by green alleys and historical monument ruins, was discovered by noted fashion designer Bina Ramani, who was the first to open her designer store there. To make the silver jubilee celebrations grand, Ramani had planned a week-long festival to celebrate the culture and spirit of the village, which is the favourite stop of foreign tourists coming to Delhi. But Ramani had to drop the plan after the villagers refused to cooperate. 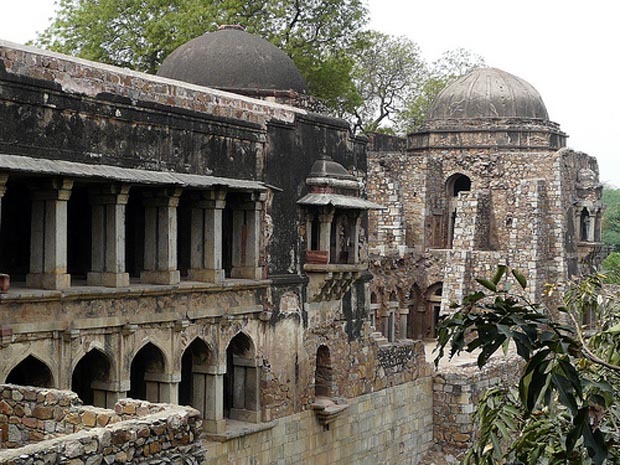 It was on March 26, 1987 that Ramani discovered Hauz Khas Village. The hub of exquisite art galleries, quirky restaurants, edgy boutiques, big brand outlets, the village is tucked in a green belt, away from the maddening din and chaos of urban centers of city. 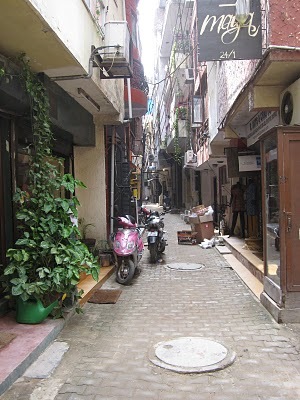 This tiny hamlet in South Delhi has often drawn comparisons with New York City’s Soho or Greenwich Village. A wide array of objects ranging from the simplest of Indian handicrafts to international designer labels is available in the village. A fleet of exquisite boutiques set in converted old homes lined up in narrow alleys sell everything from handicrafts, curios, old carpets and designer clothing (both Indian and Western). The art galleries are a prime attraction too. The feet of food joints and restaurants are also an attraction. It used to be a forlorn hamlet nestled amidst magnificent 16th century ruins. In the 1980s, it was formally designated an upscale tourist destination. The upgradation of this 12th century village began in the early 1980s when Ramani opened her showroom here. Visitors from across the city throng this market across weekdays. But the locals are always out-numbered by foreigners who come here for shopping as much to see the Mughal remnants of 16th century. Both sides of the road leading to market are dotted with ancient stone monuments, and the entire village is enveloped with domed tombs of Muslim royalty from the 14th to the 16th century. Leftovers of an ancient college are visible and the tomb of Firoz Shah, who ruled Delhi in the 14th century, is located at the periphery of this historic market. 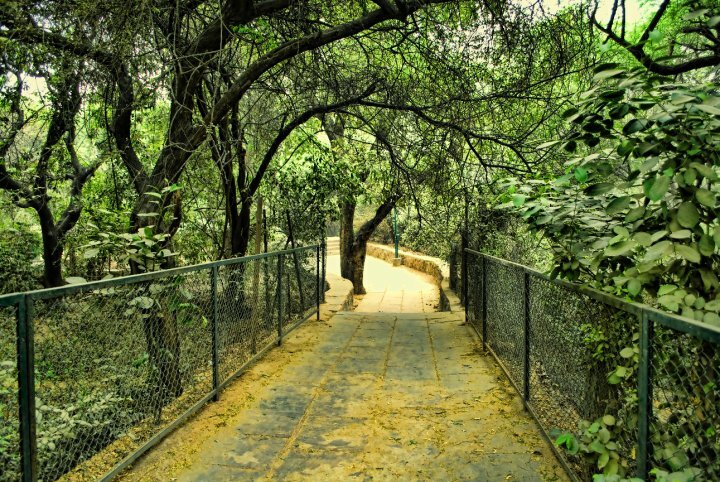 The fort overlooking the beautiful District Park is a favourite haunt for lovers and loners alike. District Park, with its vast expanses of greenery and huge lake is a place for excursions. Deer Park, where you can find deer, peacocks and rabbits dancing, running and frolicking is a must visit. In the market, you also have hand-blown glass items for the home, fine folk crafts and antique furniture for sale. This incredibly happening place has amalgamation of both modern and the old expensive shops and art galleries in a medieval maze. The village is designers’ den, showing their craft in its pristine form. You can find an impressive range in designer brands, carpets, old silver antiques, furniture and artifacts made through traditional techniques. A large mass of protestors, mostly youth, took out a rally this evening from Jamia Milia University to Okhla Head, in support of arrested journalist Mohammad Ahmad Kazmi. Protestors, most of them Jamia students, numbering around 500, vociferously chanted slogans against police and demanded the immediate release of Kazmi. They accused police of framing the scribe on dubious charges and subjecting him to custodial torture and harassment. The march started near the main gate of varsity at around 6 in the evening, passing through the campus, Tikona Park, Batla House and finally culminated at Okhla Head. There was a brief demonstration outside Okhla Head police station also. Perched on top of a car, Kazmi’s son Turab addressed the gathering. “I am requesting you all to stand up for truth and justice. Don’t let police make mockery of law by targeting innocents on flimsy grounds,” said 18 year old Turab, who has skipped his board examinations to fight for his father. His elder brother 23 year old Shauzab Kazmi vouched for the innocence of his father and thanked his supporters for standing by him and the family in these trying times. “I am really overwhelmed by the support and solidarity shown by everyone and I hope this fight for justice will be taken to its logical end,” said Shauzab. Protestors, carrying the ‘Save Kazmi’ placards and banners pledged their support to Kazmi and his family. “It is clearly a vicious conspiracy smacking of malice and vendetta against the scribe because of his unflinching stand on some of the burning issues,” said Nisar Hussain, a protestor. “Police is yet to come up with hard evidence and so we must assume that a person is innocent until proven guilty, and also there are so many questions that police needs to answer,” said Nadeem Ahmad, student of Jamia University. There is a massive protest planned on March 26 outside Indian Parliament. “We have been protesting peacefully since many days now and our only demand is free and fair investigation into the case,” said Hussain Ali, a protestor. “I request everyone to come and join us on March 26 outside Parliament so that we can put across the message to those in power corridors,” said Shauzab. Kazmi was picked up by Delhi Police’s Special Cell on March 7, while returning to his home in Jor Bagh from India Islamic Cultural Centre, Lodhi Road. He is accused of providing the ‘logistical support’ to those who attacked the Israeli diplomat’s car in New Delhi recently. According to the police, main accused have fled the country. Police has already released the sketches of three suspects. However Kazmi’s family has trashed the charges as baseless and concocted, alleging that he has been framed primarily because he is an outspoken critic of US and Israel and appears on news channels regularly. Some of the noted journalists and human rights activists have also jumped in his defense, calling him an ‘honest and upright’ journalist who cannot be involved in such dastardly crime. With ever more nerve-racking, stressful urban lifestyle, the mind-body equation has suffered severely, often resulting in chronic health conditions. So the need for exercise regimen to scamper back to full physical and mental fitness has never been more pressing. 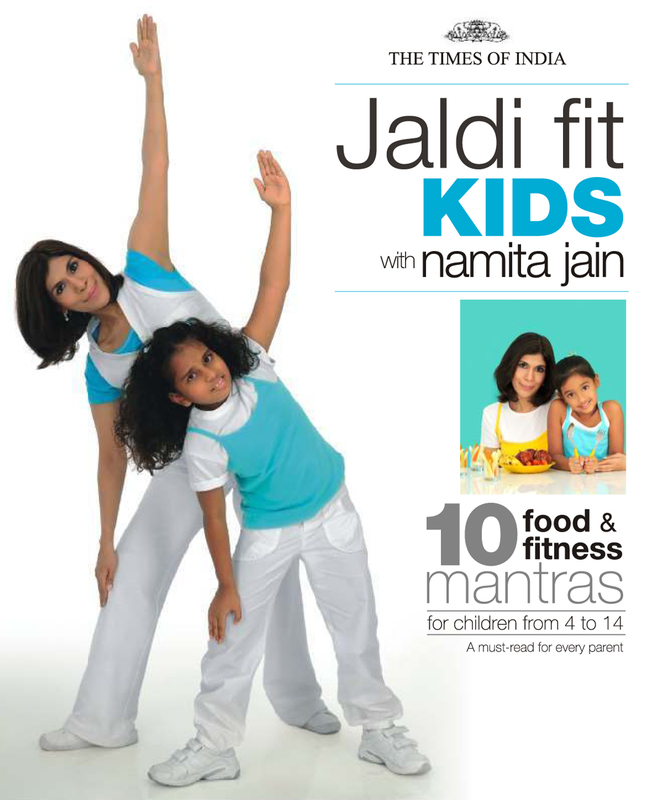 Here is Namita Jain’s fitness book “Jaldi Fit”, a handy guide to attain fitter, healthy lifestyle. Author, a renowned authority in the wellness industry, calls it a ‘one-stop-solution’ for all fitness predicaments. The book, printed in glossy paper with vibrant pictures and graphics is the product of Jain’s tried and tested regimen that she has evolved through her workshops, personal fitness classes and audience feedback over the years. Filled with fascinating details on exercise regimen, nutrition and health, informed lifestyle choices, Jaldi Fit is a fitness freak’s best manual. The book looks at cardio, strength training and stretching as three “musts” to attain envious fitness levels. “Good health is all about balancing the three exercise components”. Cardio strengthens the heart muscles and leads to healthy heart. “To maintain healthy heart, you need at least 30 minutes of cardiovascular activity for a minimum of 5 days a week.” Cardio routine minimizes conditions like high B.P, diabetes, and elevated cholesterol levels. Strength training is another cog in Jain’s fitness wheel. It’s about improving muscle quality and efficiency. “With regular training, muscles stay dense and increase in strength.” Next is stretching. A perfect way to tune up the body. Author makes it look so simple and unfussy by targeting different body parts on different weekdays. Mondays are for lower body workout. Tuesdays for abs and back workout. Wednesdays for upper workout and Thursdays are for stretching and relaxing “to reach out for stress-free mind and body.” Fridays are for total body workout – top to toe rejuvenation for your entire system. Then, you can let your hair down on weekends. There is also a jaldi fit progression guide. Author believes that to increase workout challenge is important. For that, one needs to increase duration of workout, increase resistance and add variations to workout routine. A duly practiced exercise regimen can cure Osteoporosis – a bone-weakening condition. Author shatters many a myths about this disease. The book tells us how to get rid of obesity by “creating a calorie deficit”. It shows how to beat ageing and master metabolism and goes on explaining as to what constitutes balanced diet ad nutrition. Few myths about food and fitness are also busted. Overall, Jain has done marvelous job of simplifying the tricky subject of fitness and healthy lifestyle. Go; grab a copy of book and enjoy being “jaldi fit”. 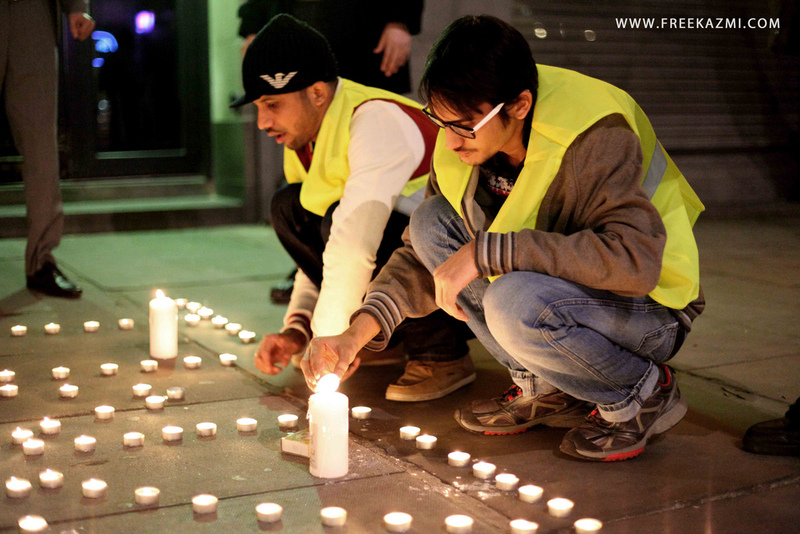 Hundreds of Indian students in UK, holding candles, carrying banners, wearing black armbands and simmering with anger, held a candle light vigil outside Indian High Commission UK on March 23, to protest against the incarceration of New Delhi based prominent journalist Mohammad Ahmad Kazmi by Delhi Police’s notorious Special Cell. Protestors demanded the immediate release of Kazmi, who has been allegedly held on dubious and unsubstantiated charges and is being subjected to custodial torture and harassment. A large mass of protestors, blurring the lines of ethnicity and religion, including many high-profile dignitaries, religious clerics, community leaders and senior members of civil society from across UK unequivocally condemned the arrest of Kazmi. The protestors alleged that he has been implicated on flimsy grounds at the behest of powerful Israeli-US lobby in Delhi. The event started with the recitation of Holy Quran, followed by introductory speech by one of the organizers. Some of Kazmi’s friends and acquaintances in UK also addressed the gathering. One of the speakers hailed him as the perfect embodiment of Gandhian values. Condemning the arrest of Kazmi, Head & Spokesperson of Islamic Human Right Commission (IHRC) Raza Kazim said the mindless targeting of innocent Muslims is not in the interest of India, but in the interests of US and Israel. “It is not about certain section of people, it’s about ordinary masses and what it is that we can actually do so that the oppressed are remembered and the oppressors are held to account and this is the message we are sending out today,” said Kazim. Many civil rights activists spoke about the importance of the freedom of speech and expression and how it is often sacrificed at the altar of ‘national interest’ or ‘strategic interest’. “It is unfortunate that innocent journalists and writers are incarcerated merely for expressing their views, which are not in conformity with official rhetoric, and it sets a dangerous precedent for future,” said one of the speakers. 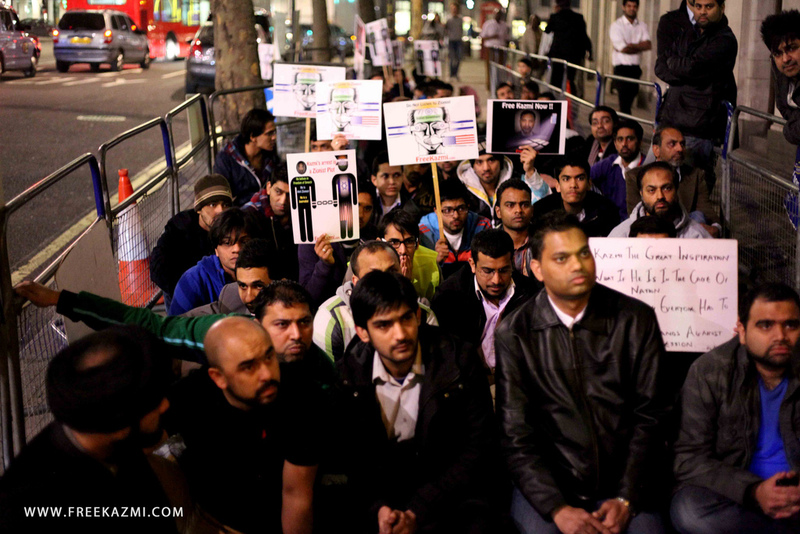 The protestors called for an end to mindless witchhunt and targeting of innocent Muslims by India police. 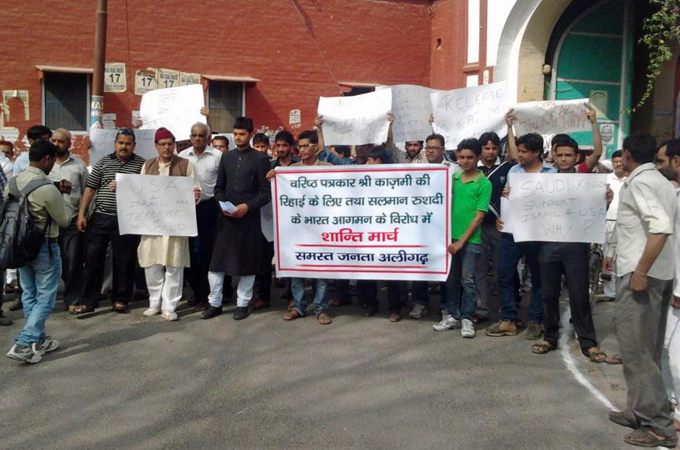 The protestors also condemned the misrepresentation of facts in certain sections of mainstream India media. Students and activists present at the vigil reacted sharply to reports about Israeli intelligence agency Mossad interrogating Kazmi. “We voted for Indian government not for Israel. Why is Delhi Police taking directives from Israel, which is already so notorious for illegal spying operations and war crimes in West Asia,” said one of the activists. The event concluded with protestors submitting a signed petition and memorandum to the Indian High Commission officials with a box of chocolates as a sign of goodwill gesture. Kazmi, a veteran journalist who has worked with Doordarshan, BBC, IRNA, UNI and is a regular columnist for Urdu newspapers in India, was picked up by police on Wednesday, March 7, while returning to his home in Jor Bagh from India Islamic Cultural Centre, Lodhi Road. He is accused of providing the ‘logistical support’ to those who attacked the Israeli diplomat’s car in New Delhi recently. His family and friends has rubbished the charges as baseless and concocted, alleging that he has been falsely implicated because he is an outspoken critic of US and Israel. He has been booked under the stringent provisions of dreadful Unlawful Activities Prevention Act (UAPA) and sent to unprecedented 20 days police remand. 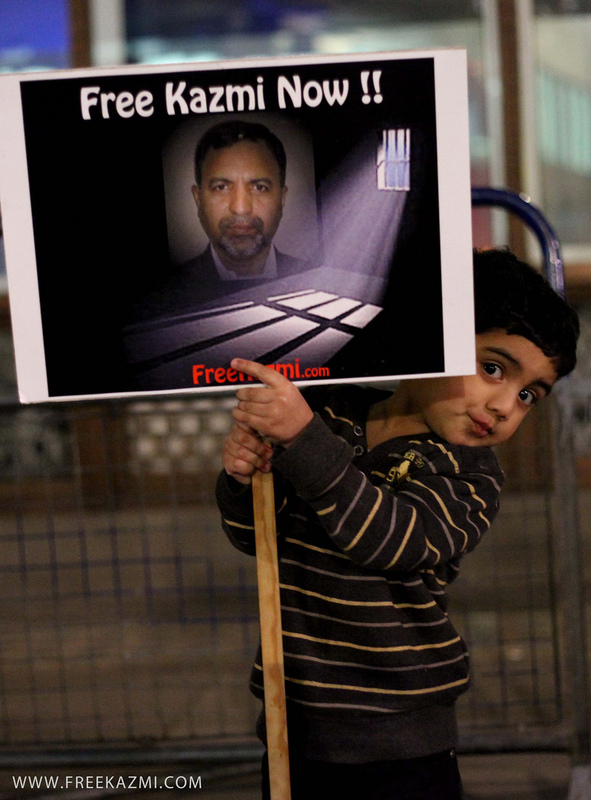 Kazmi’s counsel has said that he was forced to sign on the arrest memo hours after the arrest. The police have not yet produced any case diary, and the sleuths who arrested him were not in uniform, exposing the illegal nature of his arrest. Some of the accusations leveled against him smack of vicious conspiracy and vendetta, rather than his involvement in the crime. Q1. Looking back at the 75 years journey, do you think the mission has been accomplished? The very nature of a journey signifies that the travel is far from complete. Hence, as the journey still continues, we wish to use this milestone as a point from where we wish to step into the future. However, we are glad to have had the opportunity to serve the readers and lovers of books all these years. Rupa has been at the forefront of mass market publishing in the Indian market and has gone on to publish the biggest bestsellers of all times. We have had the opportunity to present to the book reading public such great books which have changed the dynamics of publishing all together. Q2. It all started with a dhoti-clad man, who could barely read and write English, meeting an Englishman at Great Eastern Hotel. How much has that story of daring-to-dream-and-running-the-gauntlet inspired you at Rupa? I am glad to be born in the business of books. It is truly inspiring to be able to publish books which have gone on to become cult names in the Indian market. It is always inspiring to reflect on the journey. However, the moral of the story of that dhoti clad gentleman is to be able to consistently perform to the very best of one’s potential while keeping in mind that there are greater challenges to be look forward to and to accomplish. Q4. Rupa books are everywhere today from book stalls, exhibitions, libraries to book fairs? It even bagged awards for the most attractive display for many consecutive years at World Book Fair. Is that part of your sales strategy? At Rupa, we have always believed in serving the reader and have taken on all possible efforts to reach our end readers. Through our self-owned distribution system, we have been able to permeate all A, B, C and D level towns of India. Book fairs are wonderful opportunities to meet our readers and we are glad that our stalls have been loved by them during these exhibitions. All editorial, production and marketing processes at Rupa are geared to work towards ensuring a successful sale and satisfied customer. Q5. Rupa set the trend of giving platform to raw talent like Anurag Mathur, Tara Patel, Upmanyu Chatterjee, Chetan Bhagat Tabish Khair and others. What is your take on the young writers in country today? Writing in India is continuously going through a process of evolution. The style of writing has undergone a sea of change over the last couple of years. We at Rupa have always believed in promoting young and new talent. We publish the maximum number of first time writers in the country and continue to do so. Amongst the many successful authors published by us include Anurag Mathur, Sunil Gavaskar, Chetan Bhagat, Ravi Subramanian, Neeraj Chibba, Varsha Dixit, Rashmi Kumar, Tishaa, Sudhindra Mokhasi, etc. We strongly believe in the strength of the young writing developing in the country and hope that they would contribute to literary fabric of the nation in a major way. Q6. After 26/11, Rupa published many personal accounts, sensitive and astonishing tales surrounding the event and its aftermath. And we also know how during the freedom movement, Rupa would supply books to Naini Jail, where the frontline soldiers were lodged. How much important is it for publisher to be a responsible part of the society? A publishing house is an important and integral part of a nation’s society. Books that are published and brought to the mainstream offer a platform of discussion and debate. Such discussions help in developing an informed public opinion as well as set in motion a dialogue which sometimes results in new books. Such books due to their wide reach within the intelligentsia of the society open up avenues for reflection by the decision makers of a nation. Hence, it is the duty of a publisher to further the cause of strengthening the social fabric of the country through books published by the house. Q7. Now at 75, what lies ahead for Rupa. Is there something readers should look forward to? We are in the process of working on developing new categories/ sub categories of writing which could set in motion a new style of writing for the next decade. We are currently looking at a couple of books, some of them by first time writers whom we feel might find a prominent place in the bestseller lists of the country. We would like our readers to look forward to a host of new good quality books with attractive content and affordable pricing!